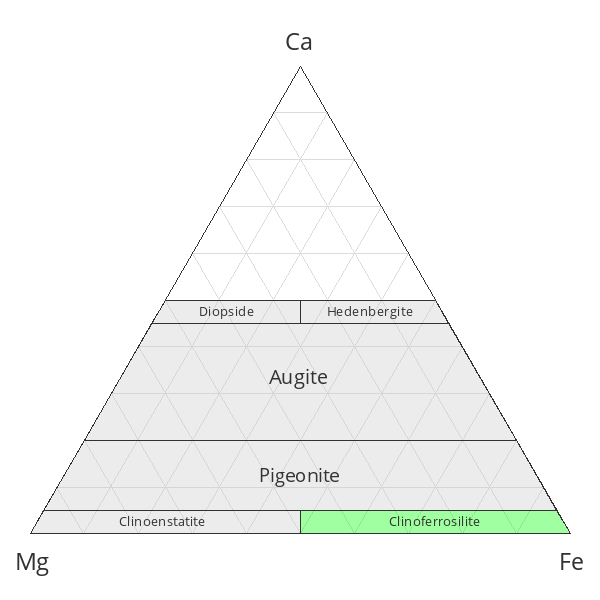 Clinoferrosilite: Mineral information, data and localities. 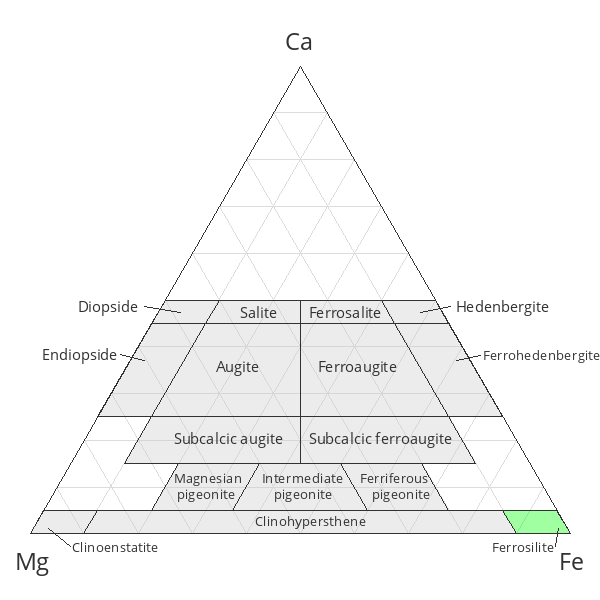 Named for being the monoclinic polymorph of ferrosilite. Note: in some previous texts the name ferrosilite was used for what is now called clinoferrosilite, whereas the equivalent orthorhombic dimorph was called orthoferrosilite, so be careful when reading older texts. Synthetic sample (pure Fe2Si2O6). Mg-bearing sample has 9.53, 9.21, 5.15 Å, 107.63°. Diopside 1 photo of Clinoferrosilite associated with Diopside on mindat.org. Bowen, N.L. 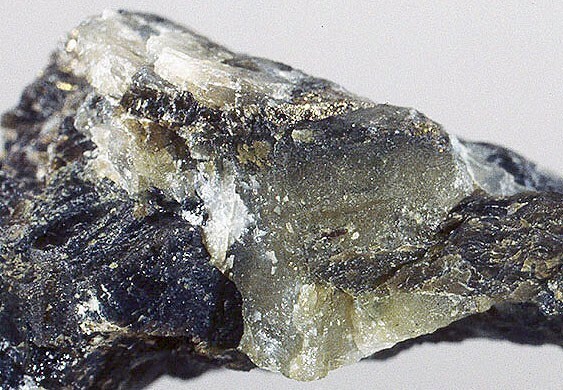 (1935) Ferrosilite as a natural mineral. American Journal of Science: 30: 481-494. Foshag, W.F. (1936) New mineral names. American Mineralogist: 21: 678. Poldervaart, A. and Hess, H.H. (1951) Pyroxenes in the Crystallization of Basaltic Magma. The Journal of Geology 59, no. 5 (Sep. 1951): 472-489. Clark, J.R., Appleman, D.E., and Papike, J.J. (1969) Crystal-chemical characterization of clinopyroxenes based on eight new structure refinements. MSA Special Paper: 2: 31-50. Sueno, S., Kimata, M., Prewitt, C.T. (1984): The crystal structure of high clinoferrosilite. American Mineralogist, 69, 264-269. Hugh-Jones, D.A., Sharp, T., Angel, R.J., and Woodland, A. (1996) The transition of orthoferrosilite to high-pressure C2/c clinoferrosilite at ambient temperature. European Journal of Mineralogy: 8: 1337-1345. BLAß, G. & GRAF, H. W. (1995): Neufunde von bekannten Fundstellen (13). Mineralien-Welt 6 (3), 47-51. Bhattacharjee, N., Ray, J., Ganguly, S., & Saha, A. (2012). Mineralogical Study of Gabbro-Anorthosite from Dumka, Chhotanagpur Gneissic Complex, Eastern Indian Shield. Journal of the Geological Society of India, 80(4), 481-492. Rocky Mountain (53rd) and South-Central (35th) Sections, GSA, Joint Annual Meeting (April 29–May 2, 2001) Session No. 7-Booth# 38. Bowen, N.L. (1935), Ferrosilite as a natural mineral: American Journal of Science, 5th. Series: 30: 481; Bradley, W.W. (1940), Thirty-sixth report of the State Mineralogist: California Division Mines Report 36: 107; Pemberton, H. Earl (1983), Minerals of California: 386. Bowen, N.L. (1935), Ferrosilite as a natural mineral: American Journal of Science, 5th. Series: 30: 481 (491 ? ); Bradley, W.W. (1940), Thirty-sixth report of the State Mineralogist: California Division Mines Report 36: 107; Murdoch, Joseph & Robert W. Webb (1966), Minerals of California, Centennial Volume (1866-1966): California Division Mines & Geology Bulletin 189: 307. Gunnar Färber - Mineralienliste 3-2017.